Succulents are all the rage and with good reason. They are beautiful, interesting, and in most cases easy to care for. They are often used as decor both indoors and out. 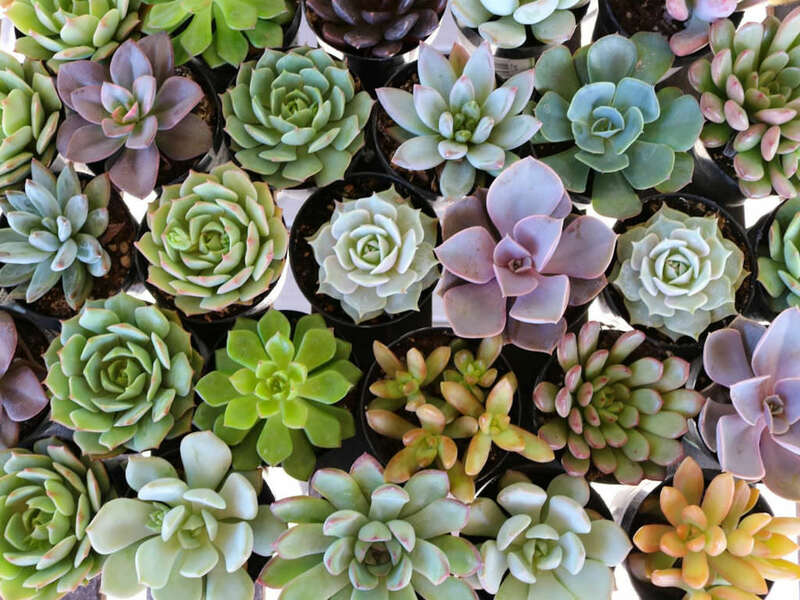 Succulents are living plants that require some care to survive and thrive, and while caring for them is not complex, knowing the basics will help you have the healthiest plants around. Succulents are a general name for any plant that has a swollen part that can hold excess water. This could occur in the leaves, stem, or even roots. Most commonly, people refer to succulents as plants with fleshy leaves, typically identified as types of Sedum, Sempervivium, Echeveria, Aeonium, and Crassula. Understanding that the word “succulents” doesn’t refer to a type of plant, but instead describes its characteristics, will help when understanding how to care for them. Plants that look “full” with leaves that start at the base of the plant and are closely spaced, particularly in Sempervivium and Echeveria that have a rosette-shaped pattern to the leaves. …or soil. Yes, pull the plant gently out of the pot and inspect the soil. Look for signs of pests, disease, or tightly-wound roots that indicate that the plant is root-bound. Just because these plants are drought-tolerant, doesn’t mean that they don’t need water. It simply means that they will be able to tolerate longer periods of drought. With regular watering and proper conditions succulents can be low maintenance and last for years. When you first plant succulents water them until the soil is damp. Then, allow the soil to dry out before watering again. There is a big difference between soil drying out and drying up. Allowing the soil to feel dry to the touch is good practice, but if it has shrunk from the sides and become hard, you’ve waited too long. Rehydrate soil that has dried up by soaking the pot in a sink or tray with an inch of water for a few hours until the soil rehydrates. Set succulents out in the sun for the best results. Again, keep in mind that all succulents do not come from the same family and some may require more or less sun than others. Plants that aren’t getting enough sun will get leggy. Plants that are getting too much sun will get scorched leaves. If you are a lucky enough to live somewhere that winters are mild and succulents’ thrive all year, then lucky you! You will likely have plenty of huge succulents around to enjoy. For the rest of us, there is an important distinction to learn about succulents in colder climates: hardy succulents need a cold period at some point in the year to thrive, and tender succulents will die if left in the cold. Hardy succulents like Sedum and Sempervivum are wonderful in cold-climate gardens, particularly in container. In the fall, move the containers under cover (but not indoors) and leave them alone for the winter. Next spring pull the pots out and set them in the sun. They will be back to their former glory in no time! Tender succulents are best brought indoors for the winter. Try to find the sunniest location you can, water a bit more sparingly and remove any dead leaves as they dry up. These pretty plants can look like they have taken a beating over the winter, whether they braved it outside or inside. Hardy succulents will need the brown outer leaves removed and the soil refreshed. Tender succulents can probably use replanting as they likely got leggy searching for light indoors.